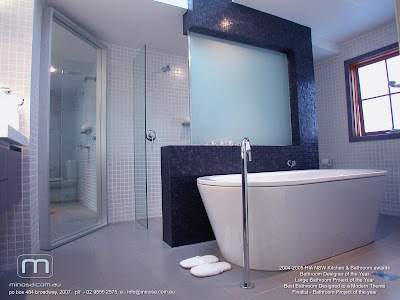 As we are about to leave for the Gold Coast and the 2011 Kitchen & Bathroom design awards (KBDI) we thought we would share some of the past kitchens and bathrooms that have been successful for Minosa over the past 10 years. So Minosa first entered the kitchen awards way back in 2003 with our first real kitchen since we had started up Minosa in 2001, this kitchen was a real game changer for us as it was the first kitchen that we had designed that really integrated the open plan idea.....the dining table is attached to the island unit making it a fixed piece of joinery and the bench seat behind the table is a great place to sit and read or drop the shopping when you come home and it is at a great height and easily accessible...it also makes for a great spot for the kids to hang out whilst Mum is in cooking the evening meals. 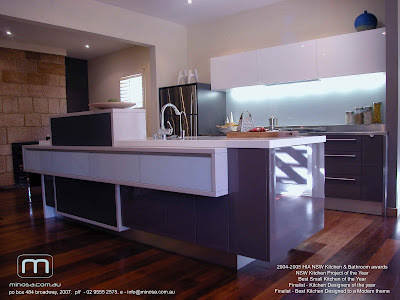 The amazing partabout this kitchen is there are some 12 finishes used and they are applied to great affect and it is as modern today as it was the day we created the 3D walk thru for our client (see youtube) . 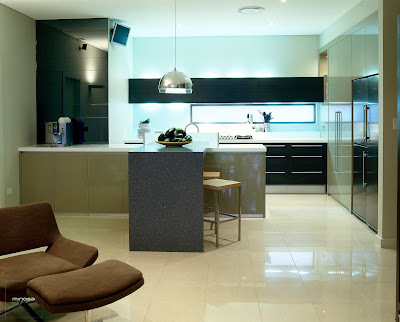 This kitchen won 6 awards, wasfinalist in another two including the International Kitchen & Bathrooms in London in 2005. 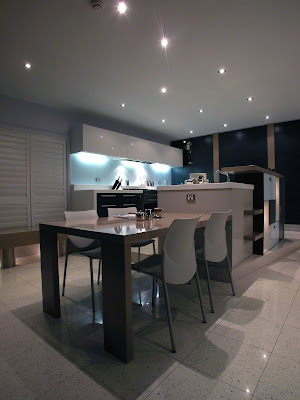 The most successful on the night was our Balmain kitchen....this was a great project as it was a small space with only one wall to work with and clients that loved to cook.....challenge! 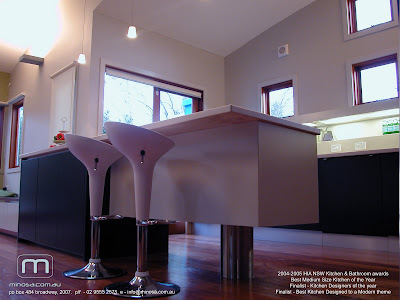 This kitchen had gadgets everywhere to utilise every square millimetre of space under the bench making it a dream kitchen to use! and difficult to build. Also check out Youtube for the animated 3D walk thru of this space. The Pallucco Italia Mirror applied to the curved wall works a treat as it guides you thru the space whilst giving a great dressing area also. Love it! In 2006 we entered what i think is one of our best pieces of work, but sadly the judges did not see it the same way.....great kitchen. 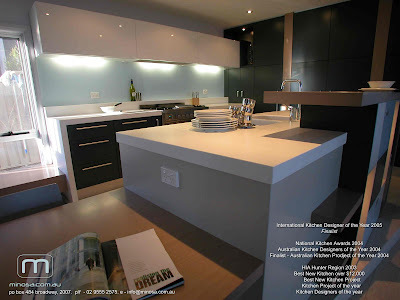 2009 brought a change, the KBDI had been formed (kitchen & bathroom design institute). The KBDI was created to focus on the design of kitchens, offer a training program that specialised in the the teaching of kitchen & bathroom design. 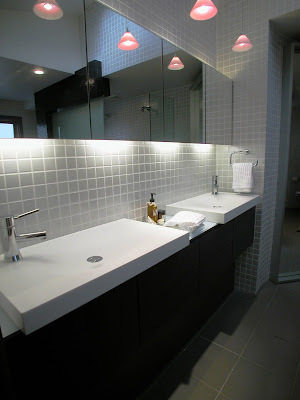 In 2009 we received three awards with two separate projects....Waverly kitchen & Queens Park bathroom both similar in the design layout...long and narrow spaces. 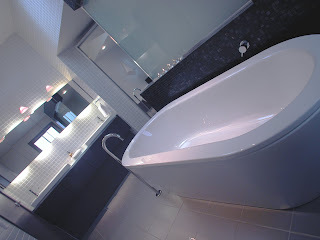 Hopefully on Saturday night our Bondi project receives recognition for it's design, these spaces are real stand outs. I will share more on this nest week.